Teach kids about money now so they can be financially savvy as adults. It’s a logical idea but finances are complex and many adults struggle with money management themselves. So what’s a parent to do? Why not start by showing them the power of compound interest and set them up for a future of financial security. Being wealthy and financially secure is an amazing feeling. It gives you freedom to live life without stress and anxiety. Who doesn’t want to give that to their children? But here’s the thing. You don’t need to be wealthy to raise financially savvy children. There are a number of things you can do to raise kids with money smarts, and over the coming weeks I’m going to explore a number of these. For today I want to chat about the one thing you can teach your children now about finances that could set them up for a lifetime of financial security. 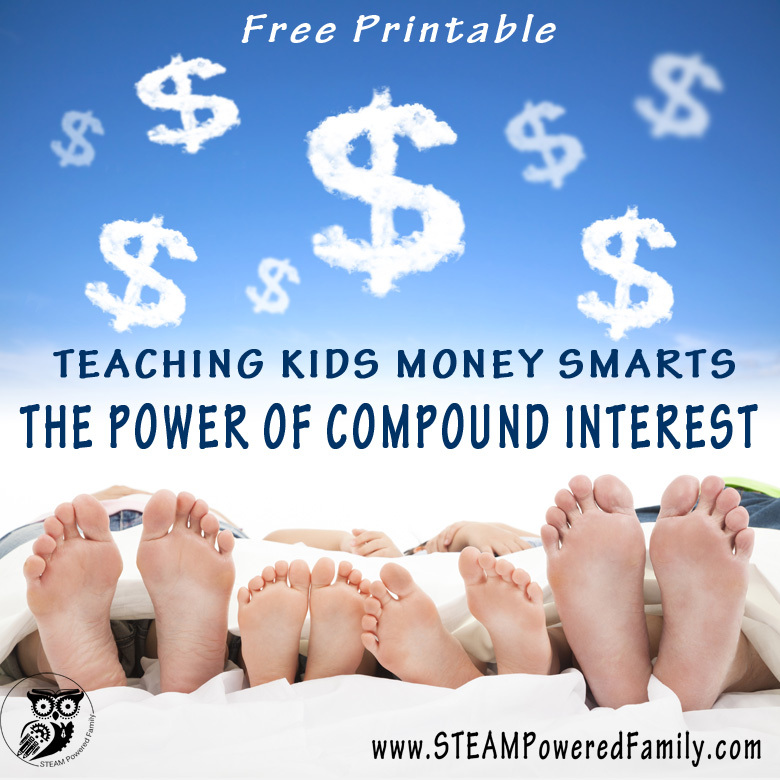 The key is to start children learning about the magic of compound interest when it has the most power. And what does compound interest need to gain power? Time. And what do kids have lots of? Time. Lots and lots of time! The secret is to start kids learning these money skills early with this simple system I’m sharing today. Start now, when your children don’t need money for anything. Sure, they have lots of wants, but do they really need anything? No. Can they still buy those wants? Absolutely, but first they need to take care of business. And that means taking care of their money so it can take care of them for many years to come. They will do this by investing their money in the Family Bank. How does this Family Bank work? It’s relatively simple. All you need is a spreadsheet or you can use a simple chart. Here is a sample one I made up and you can download for free. ~ In the first column we track the Date of all deposits and withdrawals. ~ The next column is My Contributions. In this column you input all the money that is deposited into their Family Bank Account. ~ The next column is My Spending. In this column you track all the money taken out of the bank account. Notice I am using the word “my”. This is important so children take ownership of their decisions regarding their money. ~ Next is Interest, here you input the interest rate. With young children keep the numbers really simple. This way they can follow the calculations easily and not get distracted from the true lesson, the power of compound interest! I’ve chosen to use 1%/month which works out to a 12% interest rate per year, compounded monthly. If you have older children, with a more sophisticated knowledge of mathematics and interest rates, you can use a system of compounded annual interest rates, more in line with how banks calculate interest. ~ The next column is Balance. Pretty easy, just put in the new total balance for the bank account. 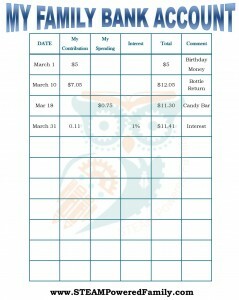 ~ Finally, add a column for Comments so you can remind your child where the money came from or went. This is really important to help illustrate lessons later on. Make sure that field is completed each and every time. To get started, open the bank account! It’s time to teach kids about money and compound interest. You may want to provide the child with a monthly allowance, or even better, a way of earning money so they can learn how money comes to a person. It doesn’t magically appear as gifts from others (oh how I wish!). Earning money takes effort and time. In the example, my son collected empty bottles that he returned to the recycle depot for money. 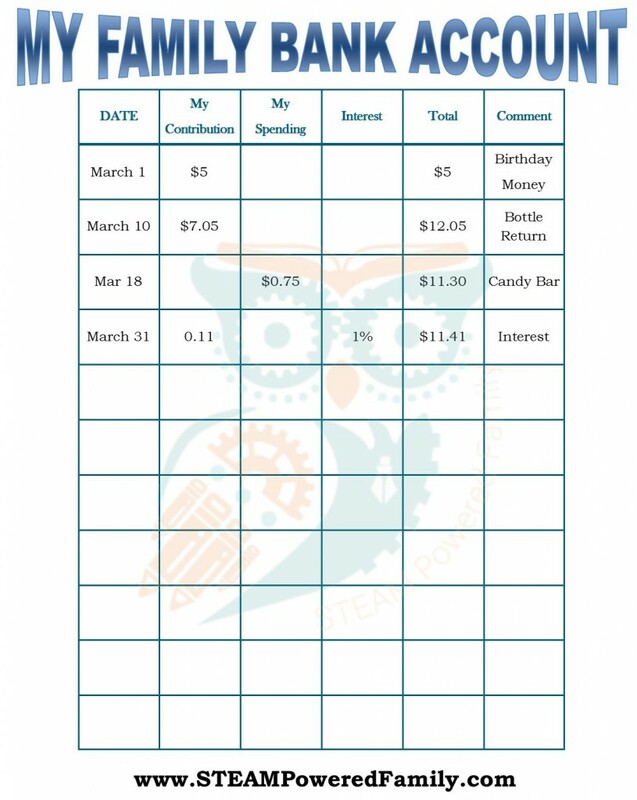 Start filling in the chart each time the child wants to make a deposit or withdrawal (and yes you may want to keep some cash on hand for withdrawals). At the end of the month sit down with your child and work out the interest for that month and add that line so the child can see how their investments are growing (or not growing if they have been choosing to spend their money). If your child is choosing to spend their money, take a few moments to add up how much they have spent and how much they would have now if they hadn’t bought that toy or treat. You should also calculate the amount of interest they would have earned on the full amount so the child can see the true cost of that item they purchased. How many adults are shocked to realize they are spending hundreds or even thousands of dollars on those lattes and dinners out? Let your child learn this lesson young so they don’t make the same mistake as an adult. Once they start getting serious about their bank account, set up a savings account for them and start putting their money into the savings account where they will actually start building a nest egg. It might seem pretty simple but running a Family Bank account like this with your children will teach them important lessons and will help build a nest egg for your child when they start their adult life. A nest egg they were fully involved in creating. My husband’s parents did this and when it came time to buy our first house in our early 20’s we had tens of thousands of dollars toward our down payment. All due to the power of regular investing and compound interest. What an amazing lesson to teach kids about money and a fantastic gift to give your children. Finances do not need to be hard, and starting early will help your kids really rock the power of compound interest. Looking to earn more money? Open your own store with Shopify. I launched my new store with the power of Shopify and it was so easy! Click here to learn more.